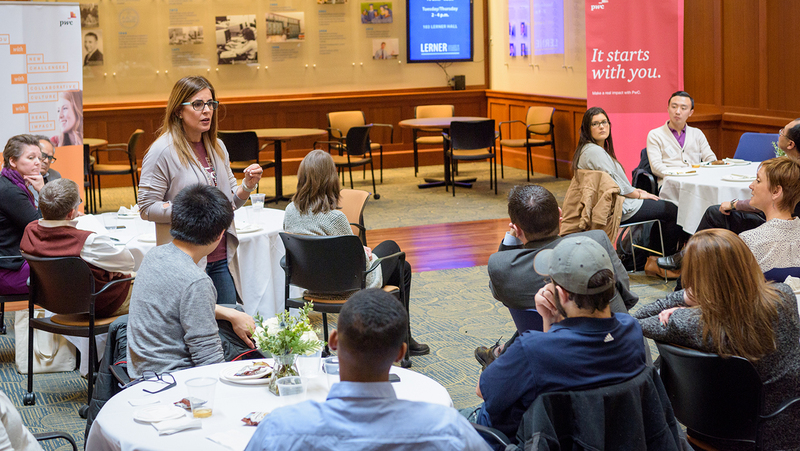 University of Delaware students, faculty and staff were recently treated to lunch and a conversation on blind spots sponsored by PwC and hosted by the Lerner Diversity Council in UD’s Alfred Lerner College of Business and Economics. Challenging Assumptions and Building Inclusive Leaders was presented on March 15 by Lety Juan, Mid-Atlantic diversity leader at PwC, Tiffany Flippen, a manager in PwC’s National Diversity and Inclusion Office, and Zahra Safa, a talent acquisition senior associate and PwC’s campus recruiter at UD. Juan opened the session with a brief video explaining blind spots and the science behind them. Attendees then participated in visual activities that showed how the brain constantly makes “cognitive shortcuts” to make sense of overwhelming – and sometimes conflicting – information. Without thoughtful intervention, these shortcuts can develop into blind spots. 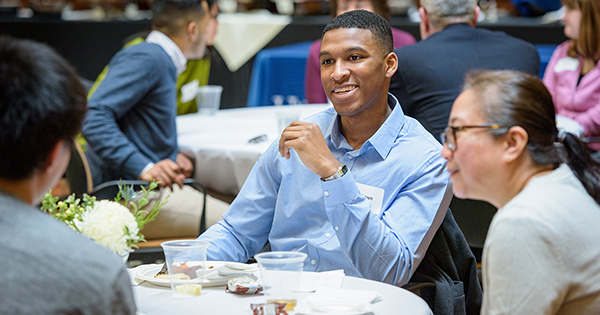 Juan encouraged attendees to be more aware of their blind spots, and to use that awareness to broaden their perspectives and build diverse, inclusive teams at school and in the workplace. Juan handed the presentation to Flippen, who explained different types of bias, including the “halo/horn effect” (assigning good or bad attributes to a person based on our initial impressions) and similarity bias (gravitating toward people and ideas that affirm one’s own beliefs). To illustrate these biases, Flippen walked through several scenarios drawn from participants’ own experiences. For each example, Flippen and Juan identified techniques for overcoming bias and assumptions, like asking thoughtful questions, considering different viewpoints and staying objective. “When we’re working with people, we need to be conscious about facts, so that we know the whole story,” Juan said. Students and faculty alike said that the session resonated with them. Ali Poorani, associate professor of hospitality business management, also enjoyed the session, noting that he already employs many of the concepts presented by PwC in his human resources management classes. Juan encouraged attendees to visit Outsmarting Human Minds, an educational website created through a recent grant from PwC to Harvard University. Visitors can find a wealth of resources (including videos and podcasts) intended to foster conversation on diversity and inclusion, including blind spots. The Lerner Diversity Council’s next lunch-and-learn session, presented by Reviresco, will focus on bridging the military-civilian divide. The event is planned for Thursday, April 19 at 12:00 p.m. in the Lerner Atrium. All UD students, faculty, and staff are encouraged to attend. Register here for the April 19 session.